Here I am under the canopy of what has been dubbed 'the happy lamp’ by its many fans. This is at The Light Salon at Harvey Nichols in Knightsbridge which is an absolute delight, a private area with two comfy chairs each with an adjustable light-canopy that emits skin-rejuvenating LED light. This isn't your common-or-garden red LED light (though that is very good for the skin, and for calming inflammation and boosting collagen levels, particularly if you do it regularly). 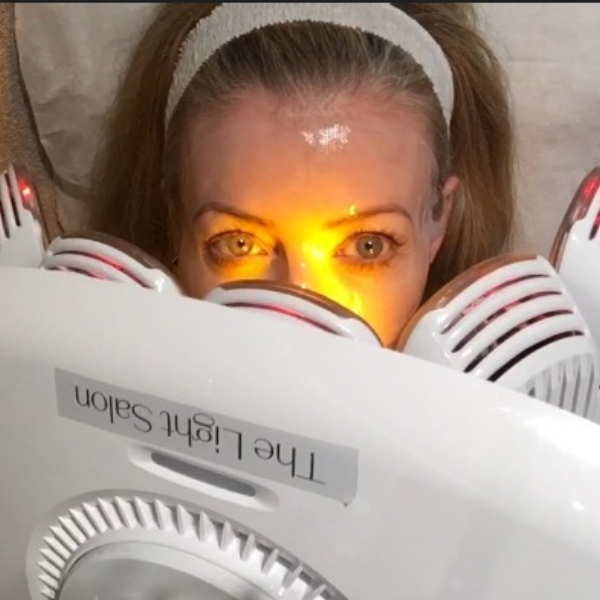 What you get in a swift 15 minute session at The Light Salon is first yellow light (which improves communication between the skin cells) and then near-infrared light which penetrates 15cm deep into the face and helps stimulate bone tissue as well as promoting the growth of collagen and elastin in the skin. What I hadn’t realised was that near-infrared light also lowers cortisol levels (that’s the ‘stress' hormone) and boosts levels of serotonin (the ‘feelgood’ hormone). After 11 minutes of this, I felt supremely relaxed - all the more so because I hadn't been expecting this added bonus, and that super-chilled feeling stayed with me for the rest of the day. You need several sessions of this to get full benefits for your skin but even after one, which was finished off with a light massage, my skin looked terrific. I’d go back just for the calming effects of those lights.